The second part of this blog will elaborate on the actual creation of the API definition in APIPCS, the invocation of the microservice using Groovy scripting and the testing of the external API using APIPCS. At a customer, for a proof of concept last year, I have been working with an exiting new Cloud Product from Oracle: API Platform Cloud Service, or APIPCS for short. 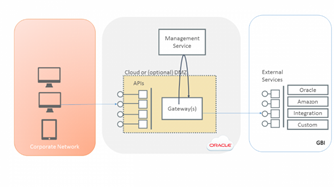 In this blog, I will not go into architectural details on why you could, should or must use an API Manager of API Gateway. Nor will I be elaborating on all functionality or features of Oracle’s implementation of the product, since they’re perfectly capable of doing that themselves. In the use case encountered at this specific customer, the requirement existed to not use the API Gateway as an inbound Gateway, but rather to use the API Management solution as an outbound gateway. The rationale for this setup is to provide a single outbound gateway through which REST services can be invoked where internal identifications can be translated into different kinds of external identifications, known to the outside world. The former may be thought of as (internal) applications, or perhaps even customer identifications stored in an internal system. The latter category then may relate to API-keys required by the external partner, or even OAuth2 tokens. Read the complete article here.